The Miller Multimatic™ 200 welder is Miller's first truly portable multi-process welder. The Multimatic™ 200 is an industrial MIG welder, Stick welder and DC TIG welder all-in-one. The Multimatic 200 package with WP17 TIG Contractor Kit includes all the equipment you'll need for MIG, DC TIG and Stick welding. Auto-Set™ Elite allows the Multimatic™ 200 to run on either 120 volt or 230 volt input power using Miller's exclusive multi-voltage plug (MVP™). The Auto-Set™ Elite feature also allows the user to either automatically set MIG welding parameters or fine tune voltage and wire feed speed (amps) manually, providing a custom, precision welding arc. 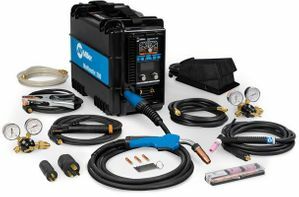 Standard TIG Kit gives you everything you need for remote TIG welding with the Multimatic 200. Kit includes RFCS-6M remote foot control, Weldcraft® 150-amp WP17 TIG torch with 25-mm Dinse connector, AK-2 torch accessory kit, regulator and gas hose. TIG Contractor Kit #301287 - Includes RFCS-6M remote foot control, Weldcraft® 150-amp WP17 TIG torch with 25-mm Dinse connector, AK-2 torch accessory kit, regulator and gas hose. You can qualify for a rebate up to $400.00. The basic rebate on the Miller Multimatic 200 With WP17 TIG Kit 951649 is $200.00. To qualify for the additional $200.00 you must purchase on the same order as the Multimatic an additional $500.00 worth of Miller family accessories.There are however lesser levels of this rebate. If you purchase $300.00 of additional accessories you would qualify for $100.00 rebate and if you purchase a $150.00 of additional accessories you would qualify for a $50.00 rebate. Will the Blue Star 185 be able to run this Multimatic efficiently? Miller advises that when running the Miller Multimatic 200 Auto-Set Elite Welder 907518 off of the Miller Blue Star 185 Welder 907664 on 120v there would be no issues in stick,mig or tig mode. When running on 230v only mig and tig are recommended. What's the difference between the 200 and the new 215? My current building has 208 volts single phase. 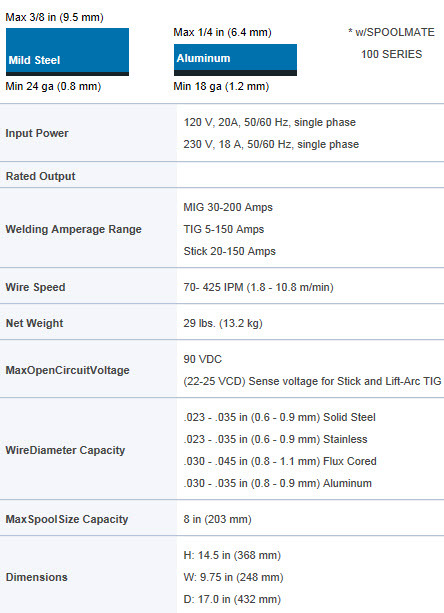 Will this welder work properly on this voltage? 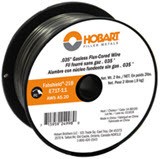 Will the Harris E70S-6 MIG Welding Wire - 11# Spool work in this machine or will i have to buy the smaller spools? If you purchase the Miller Multimatic 200 With WP17 TIG Kit 951649 for use without a foot pedal or remote hand control you can use a WP 17 style tig torch plus a Miller TIG Torch Power Adapter - Gas Through 25mm DINSE 195234. We make this torch and adapter available as a package (Weldcraft WP17 TIG Torch Package w/25mm Dinse Connection WP1725RDI25). This package is only available with a 25ft torch. on this machine can you change the post flow? 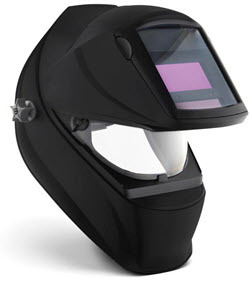 If I purchase one of these welders along with the wire spool, will it qualify for the helmet and a $500.00 mail in rebate? Thanks. hello if i purchase the aluminum spool gun with this welder also , how much of a rebate would i be getting back? and do i choose the helmet or is it just a basic helmet already choosen? So based on current sale , it says I can buy the kit with the tig equipment and qualify for the $250 rebate. If I buy $500 extra I can get $500 off. Is this still true? How long does it take to get the 500 rebate?rebate I made the purchase yesterday. The Miller Multimatic 200 With WP17 TIG Kit 951649 is shipped in separate cartons. The shipping carton for machine itself measures 17" x 15" x 10" and weighs 50lbs.The Tig Kit shipping carton measures 14" X 13" X 9" and weighs 14lbs. The Miller Multimatic 200 With WP17 TIG Kit 951649 has 30% duty cycle at the rated output . I notice this is very light, is this inverter technology or transformer or else? what kind of warranty it has? Wondering if the miller multimatic 200 will weld aluminum with the TIG? I know you can stick weld aluminum with this. But ,can you mig weld aluminum with this and can you hook up a spool gun? The tig contractor kit that comes with the Miller Multimatic 200 With WP17 TIG Contractor Kit 951586 no longer comes packaged in a carrying case. Miller advises that this case is no longer available can no longer be purchased as a separate item. They do not offer any cases that can be substituted. Currently there are still contractor kits available for the Miller Multimatic 200 With WP17 TIG Contractor Kit program.. This number is dwindling and once they are gone the free program will end. The Miller Multimatic 200 With WP17 TIG Contractor Kit 951586 has a 6 pin remote control receptacle. The Miller RCCS-6M Remote Fingertip Control 195184 has a 6 pin plug which will connect directly with the Multimatic.. The Miller RCC-14 Remote Fingertip Control 151086 has a 14pin plug. In order to use this remote with the Multimatic you will need Miller 6-Pin To 14-Pin Remote Control Adapter Cord 300507.
can this welder be run off a generater? The Miller Multimatic 200 With WP17 TIG Contractor Kit 951586 can be run of of a generator. You will need a 5000 watt generator in order for the machine to operate properly. do I have to remove the mig torch to stick weld? You do not need remove the mig gun in order to stick weld with the Miller Multimatic 200 With WP17 TIG Contractor Kit 951586. Although you placed your order the Miller Multimatic 200 With WP17 TIG Contractor Kit 951586 before the January 31 dead line you are not eligible for the $250.00 rebate. Reviewing your order we see that you did not purchase the additional $250.00 of qualifying accessories that was required.. The rebate was not off the price of the machine but off the accessories..Basically after the rebate was processed Miller would send you a check for $250.00 and in the end you would have the accessories for free..
You cannot tig weld aluminum with the Miller Multimatic 200 With WP17 TIG Contractor Kit 951586.. The Multimatic produces DC weld output only. Tig welding aluminum requires AC weld output. Can I purchase this product along with other products for the $250 dollar rebate over the phone? And what about the warranty? is the warranty under cyberweld or miller? Are this welders refurbished or new as in NEVER used? I would like to buy this set with $250 accessories, can you write or notice me the serial no. on the purchase invoice then email to me before you ship out. I need to fill and join the $250 Rebate program. Thank you for your help. In order to participate in the rebate program for the Miller Multimatic 200 With WP17 TIG Contractor Kit 951586 you will need to order the machine and the accessories at the same time and they all must appear on the same invoice copy. When you receive your order you will also receive a copy of the rebate form. You then fill out the rebate form and send a copy of you invoice to Miller and they will send you your rebate check. What accessories qualify for the $250 rebate offered on this? In order to qualify for the Miller $250.00 rebate you must purchase the Miller Multimatic 200 With WP17 TIG Contractor Kit 951586 plus $250.00 of Miller family products. This includes Miller, Hobart, Weldcraft, Smith, and Bernard. Anything.. Helmets, gloves, spoolguns, tig accessories,mig gun parts, even another machine.. Anything .. These accessories must be purchased along with the Mulitmatic 200 and must appear on the same order.. Okay from what I understand: If I purchase the welder it comes bundled with the contractor kit and if I purchase another $250 in "qualifying products" I also get a $250 rebate? If so what are the qualifying products? I see the spool gun is strategically priced just shy of $250 so what else can I buy to get the rebate? Im interested in the millermatic 200, what is the difference from buying from Miller vs cyberweld? Are your welders refurbished? and how about the warranty? Is this an inverter machine?Thank you for your help.. The only difference between purchasing the Miller Multimatic 200 With WP17 TIG Contractor Kit 951586 from us or from Miller is the price.. All the machines we sell are brand new, and have a full Miller warranty. The Multimatic 200 is an inverter based machine . I have a small town repair shop as a hobby/ second job. I got this about 6 months ago so i figure I've had enough time to play with it to write a decent review. This welder leads the pack in multi processes by a mile. I've compared this with the ESAB rebel and the Lincoln 210 mp and they don't stand a chance. The arc stability is better then some of the bigger 200 300 series migs that I've used! Yes the price tag is a little high, but the machine is just about bullet proof. The only Con that I can find is that there is not a cart made for it anywhere on the market, at least that I cant locate. I've had to make my own out of an old wheel chair. It works but not nearly as efficient as a regular shop cart. ProsAmazing performance, gets any job I need done. Portability and reliability. ConsNo cart made for it that I can find yet. Had this guy a couple weeks as a replacement for and older Miller mig. It burns the prettiest welds with ease! Haven't tried the tig kit yet but I'm really happy so far. So far I have been highly pleased with my Miller Multimatic 200. I have to be honest I have only used the Mig process so far, but on 220 volts this thing really welds nice. I'm sure it will do great on 110 as well, I haven't got to play with the settings that much. I bought this welder with the intentions of starting a small fabrication side business, and so far I have about payed for this welder in a few months. The versatility of this machine is great and I can take it anywhere. I was looking to get a engine driven welder, but did not have the cash to do so, so I thought this would be a good start and so far it has been great for the applications I have used it in. ProsPortable, Plenty of power, Versatility, well priced for all the features you get, Miller was giving a $200 rebate when purchasing this welder before the end of the year as well. ConsCan't tig aluminum (expected), Duty cycle is a little light, I hope the hard plastic clips that hold the door on for the wire feed do not break. Great machine, I have only had it a week and finished building a ramp for an RV/Toyhauler. Really like it so far! I'm impressed by its size and what it can do. I have just practiced a little bit, but my welds look better than ever before. Simple to use! Excellent piece of equipment! Performs exactly as advertised. Speedy delivery too! ProsSize, capabilities, duty cycle, and lift start on GTAW. it appears i have to learn to weld all over again. not use to a machine that pre-programs things for me. use to be trial and error now it's push the auto button and it just happens. I haven't had time yet to put the welder through it's paces, but the shipping was fantastic! It was said to ship in 6 to 9 days, but it arrived in 3 to 4 days from the date of order, and I had to check the label to see it was really from you--because it got here so early! The welding machine is one of the best I ever used, if there is any better. I started welding with Jody from Welding Tips and Tricks I am not a pro but with the help of those two I have got my first $4000 job done easily and finely. I wish on the next portable machine Miller will include high frequency start and custom regulated voltage and amperage and higher duty cycle. ProsPortable 3 in one machine. Similar to the maxstar sth I use at work but with mig. Perfect for what I need it for. I have done everything this welder can do using the 110 volt option and it has been great. Looking forward to trying this hooked up to the generator out in the field. ProsReally like the auto set. Arrived quickly, well packaged, and in perfect condition. Setup was easy and quick. Autoset features were spot on for perfect beads. Very pleased with this rig! Very happy with the welder and service from Cyberweld. I am not a professional welder but I have been welding for 35 years. I have never used a welder this nice! It welds so smooth and is very easy to use. The auto-set elite is incredible. It sets the wire speed and heat perfectly every time. I haven't had a chance to stick weld yet but there is no doubt that it will perform equally as well. Thanks Cyberweld and Miller! For light work it cannot be beat, I have pushed it to weld heavy metal. Portabilty flexabilty I would not be without it. Had some trouble with the read out in cold weather. Miller serviced the unit and got it back to me. Finished rebuilding the lip on my utilty tractor bucket this A.M. for moving snow. Did some very light sheet metal with the mig, The auto set worked as advertised. I am a volunteer firefighter here. Welded braces on the bumper of our twin screw tank truck, patched holes in the stainless steel fenders and lip of the stainless tank. Used a flapper wheel to finish the welds and you cannot tell where the holes or cracks were. It preformed like the champ it is. Miller hit one out of the park with this one. ConsAngry I did not buy one sooner. Couldn't be happier with this welder. For the price, you can not go wrong with the multimatic 200. I have been very satisfied with this welder. ProsSo many uses in such a small package. ConsPlastic case is a static magnet for dust. Keep it covered. ConsNeed to have a option to use UPS, FedEx was horrible!!! !